So I was not the biggest Harry Potter fan around but this way before I saw Harry Potter and the Goblet of Fire. Yet still, I wasn’t crazy about the Potter mania like many I know are. However, watching Harry Potter and The Deathly Hallows has compelled me to say otherwise. I am a fan and how! Whenever one [me to be precise] hears about a great series as such, to be realised on the big screen, I am left with a twinge of disappointment. Harry Potter, on the other hand, is a series that is very rightly realised on celluloid as compared to the many literary masterpieces which have tasted dust. From the very beginning the plot seems to creep up onto you. "These are dark times, there's no denying," said the Minister of Magic, Bill Nighy. Yes, this very sentence sums up the last book. To start with, the colour of the film, I mean the treatment, living up to the theme, is all gray, cold unlike the magnificent magical dining room at Hogwarts. Hermione casts the 'obliviate' spell on her parents, sure enough, her very essence from their life begins to disappear. And the Dudleys, they move too as they know its not safe enough for them either. If the muggle world is that paranoid, one can only imagine what the world of wizards and witches must be feeling! As avid readers (of books) and viewers (of the film series), will have already seen/ read the 1st offering of the last book, I am now only putting forth the things I really loved about the film. Again as I mentioned above, the colour treatment of the film sets the tone and the mood. There is no warmth and things get really dark pretty soon. Poly juice potion sure is very handy when it comes to creating 7 Harry Potters' to trick the Dark Lord! There is a light moment when Fleur Delacour transforms in Harry and is afraid that Bill (Weasley), her fiancé, might be disgusted looking at her as Harry. 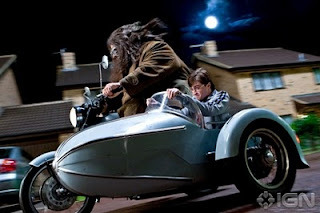 I love Hagrid's beautiful vespa! Would love to fly in it! For the first time, one is enthralled with gorgeous locations outside Hogwarts. This is when one realises that Harry, Ron and Hermione, the film itself, has come of age. There is no Dumbledore or the familiar haunts within Hogwarts. The film is shot in forests covered in sheets of snow, gorgeous beaches and cliff tops. Ron is even more adorable (I think) as himself yet his character evolves greatly as the film proceeds. For Ron, the book/film, is a turning point. A lot of things are coming into the forefront for him, especially his feelings for Hermione. He experiences fear, jealousy, hatred, and most importantly realises how important their friendship (the three of them) is. Finally love in the form of Ginny Weasley presents itself to Harry and their impromptu kiss is indeed romantic! Dumbledore, if not present in flesh, leaves the three with invaluable gifts; For Harry it is the Golden snitch he captured in his first Quiditch match, for Hermoine it is his own copy of Beadle the Bard, and for Ron, he left him with the Deluminator. The film also lays the ground for the fact that one of the Weasley twins is going to die at the end of the battle. One is seriously injured in the few minutes into Part 1 already. Very disappointing! Mad Eye Moody and Hedwig die as well. And Doby, the cute elf, is killed by Bellatrix Lestrange. The film ends with a lot of promise that there is a lot one has to look forward to and the main battle is yet to begin. If you haven't watch it yet, shame on you. So I didn't know Nikita's a reviewer too !! Rectified...thanks and yes, I would love the marathon bit! i've read the series 9 times!!!!!!!! not a great fan of the movies but even i have to agree that this one was the best! i have cried all the 9 times when dobby died in the book! n i must say that m impressed the movie could create such an uncanny scene! so so desperately waiting for the final movie! Shame on me. I haven't watched it yet. Some of my friends tell me it is boring and slow. Wow 9 times! I think I am going to start with the books soon. Your friends are silly and don't want to grow up. This film is a must watch. Go watch it soon. I watched it , and i was pitying myself why the hell did i watch it ... It should have come with a tagline "only for below 18 years "
Does the smile imply something more? "Harry Potter, on the other hand, is a series that is very rightly realised on celluloid as compared to the many literary masterpieces which have tasted dust. " I disagree with this one maybe bcoz i love the books too much and the story telling is so vivid, celluloid does not quite do justice to it. Or it could be bcozz I saw LOTR and the movie blows everything else thats mythological out of the water! This movie was by far the best in the series - thats what i thought when i went to watch it. It cannot compete with the cuteness of the 1st movie, but then - as you pointed out - this is a dark movie, thus its different. The review was very nicely done... now I dont have to do mine as it would be very similar to what you have said abt the movie.. including the pics! Keep it up Nik!